for independence, reason, and patriotism. That compromise was manifested in the doctrine of "republican womanhood" which perpetuated women's exclusion from citizenship but afforded women sufficient educational opportunity and family influence to raise citizens and educate statesmen for the new republic. 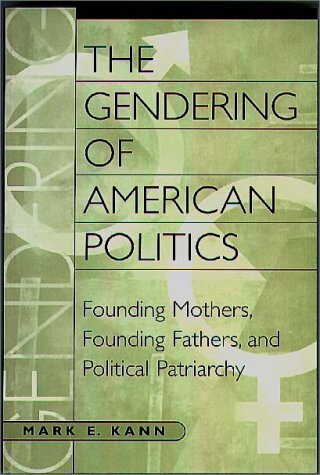 The gendering of American politics was concluded by a second compromise. The founders often expressed a desire to exclude disorderly men from public life and empower a few heroic men to exercise great leadership powers, but they generally settled for granting weak citizenship to most white family men and supporting elite government by accomplished gentleman legislators. Megan Seely is a third wave feminist and activist. She was the youngest-ever elected president of California National Organization for Women, serving two terms from 2001 to 2005. An activist from a very young age she has been involved in community organizing and feminist activism on local, state, and national levels. She lives and teaches in northern California.Mark E. Kann, Professor Emeritus of Political Science and History, held the USC Associates Chair in Social Science at the University of Southern California. He is the author of Republic of Men (NYU Press, 1998) and Punishment, Prisons, and Patriarchy (NYU Press, 2005).